« People of NSW – start your scanners! Our built environment has a huge impact on our lives. And we all have strong opinions about what it should be like. One of the major things that determines this is the planning process that our councils look after. If you’ve ever tried to make a submission on a development application you will know that it can be a difficult process to understand. Chances are you’ve not bothered because it all seemed like too much trouble. Today we want to let you know about a new PlanningAlerts feature which makes this simple. Now when you click on a development application, you’ll be able to make a submission to council right on the PlanningAlerts page for the application – no more hunting down the right form, email address or even which council to send it to. We do the boring stuff for you automatically. This means you have the opportunity to directly affect whether an application will get approved or not. It “closes the loop”, so that not only do you find out about things planned near you, you can easily and directly do something about them. You also get to see what other people have said because all comments automatically go up on the site once they’re sent to the planning authority. Over the next couple of weeks we will be rolling out the new feature, adding it council by council. 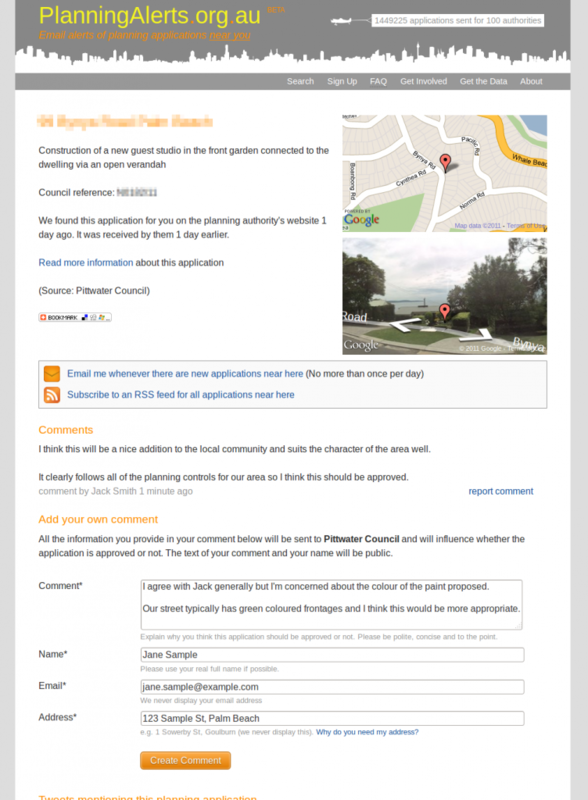 When the feature has been rolled out for your council you will see the big new comment box. If it hasn’t been rolled out yet you can help by finding the email address that submissions should go to for your council and sending that to us. As this feature is brand new it’s bound to have some niggling problems. So, please help by letting us know about any problems that you find or things that could be done to improve the service. To get started go to http://www.planningalerts.org.au/ and enter your street address. It’s your neighbourhood. Make sure you have a hand in how it develops. This entry was posted in Announcement, PlanningAlerts.org.au and tagged commenting, comments, development applications, planning applications, planning submissions, planningalerts. Bookmark the permalink. Post a comment or leave a trackback: Trackback URL. WOW I’m impressed, this is an extremely good feature and it was already very good before! This is a great improvement, keep up the great work! I’m sure Council will welcome additional comments on things like paint colours chosen. We all know some colours are great (e.g blue and red) but some are terrible (e.g green and cream) – so all those people proposing bad paint colours – watch out now!! !